SNHR said today that no less than 18 attacks on vital civilian facilities by the parties to the conflict were documented in November. This report draws upon the ongoing monitoring of news and development by SNHR team, and on accounts by survivors, eyewitnesses, and local media activists, in addition to analyzing a large number of videos and pictures that were posted online or sent by local activists. According to the report, the second half of November saw an escalation in bombings by Syrian regime forces in Idlib de-escalation zone. These attacks caused severe damage to several vital civilian centers, as did the continued insecurity in the Syrian north, which was accompanied by an unprecedented rise in bombings, whose perpetrators we have been unable to identify, for the eighth consecutive month, which resulted in an increase in the number of vital facilities damaged. 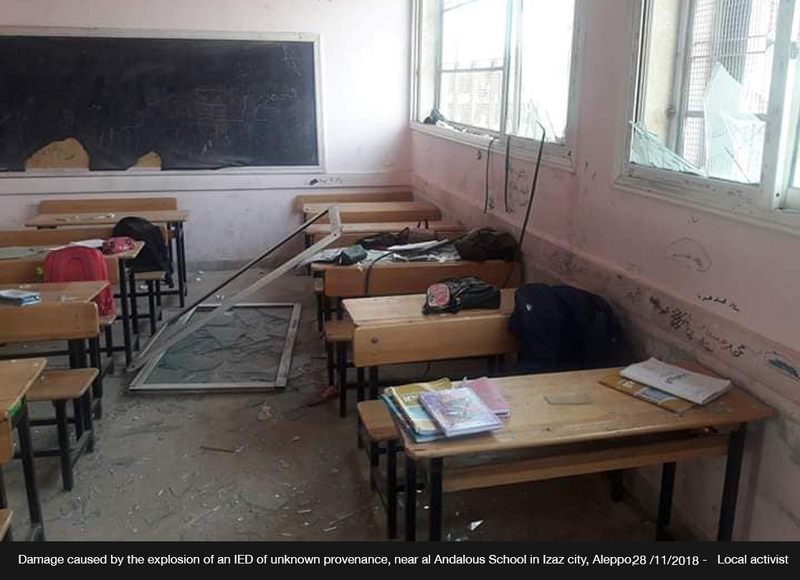 Meanwhile, Idlib governorate saw the largest number of attacks on civilian vital centers in November with 11 incidents, followed by Aleppo governorate with 5 incidents. The report documents 554 attacks on vital civilian facilities since the start of 2018, while the report documents no less than 18 attacks in November, including 7 attacks by Syrian regime forces. In addition, Hay’at Tahrir al Sham was responsible for one attack, Kurdish Self-Management Forces for one attack, international coalition forces for one attack, and other parties for 8 attacks. The report breaks down the vital facilities that were attacked in November, which were as follows: two infrastructure facilities, five places of worship, two vital medical facilities, 7 vital educational facilities and two IDP camps. In addition, the report notes that the other parties have carried out attacks that targeted civilian objects, which also resulted, in some cases, in loss of lives. These violations might qualify as war crimes. However, these violations don’t qualify as crimes against humanity, as with the Syrian regime and pro-regime forces.